I interned with The Oakland Press from April to September of 2013, contributing more than 40 pieces to the publication. Writing in this section provided me with more experience with event previews, features, local news and concert reviews, for a professional publication. Below are some of my favorite clips. Click here for a complete list of my clips. Though the world is changing, there’s still a place for The Backstreet Boys. The quintet proved that on Thursday night, Aug. 8, at DTE Energy Music Theatre, with performances of their most popular songs as well as new tracks from the just-released “In a World Like This” album. This was my first concert review, an experience totally new to me. As the storms cleared on Tuesday night, May 28, above the Meadow Brook Music Festival, Of Monsters and Men celebrated with warmth and excitement during it’s 14-song, hour-and-45-minute set. Folk art will be displayed at the Lawrence Street Gallery in Ferndale, as West Bloomfield artist Alice Frank presents her exhibit “Artful,” beginning Wednesday, May 1. With schools cutting music programs, Got Harmony Day Camp and Benefit show provides an opportunity for young people ages 11 to 25 to explore music through a day of training and performance, said program marketing coordinator Carole Essenmacher of Vassar. Milford’s Central Park will see an orchestra of proceeds this week, with the presentation of “Prelude,” the first movement in a series of fundraising events for the city’s new AMP performance stage. John Lennon, Elizabeth Taylor, David Letterman and James Dean are just some of the subjects of Birmingham Artist Tom Maniaci’s pop art works for charity. 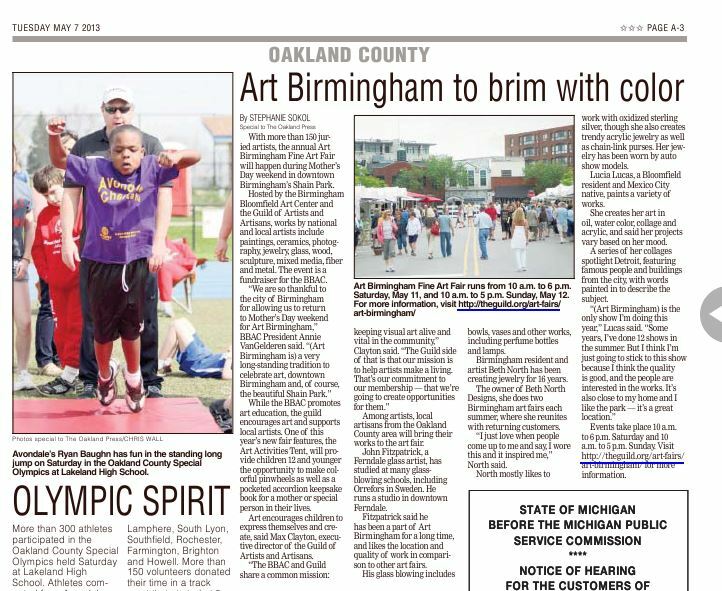 Art Birmingham was my first story in print for The Oakland Press. With more than 150 juried artists, the annual Art Birmingham Fine Art Fair will happen during Mother’s Day weekend in downtown Birmingham’s Shain Park.